A great voice has been silenced. 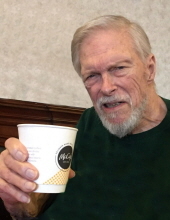 Randall Mason Easterling, 87, of Vandalia, Ohio, died unexpectedly Wednesday, April 10, 2019, at Miami Valley Hospital in Dayton. He was born Aug. 30, 1931, in Middletown, Ohio, to Caleb and Ella (Fultz) Easterling. Randy retired after 25 years at the United States Postal Service. But “Ramblin’ Randy Mason” was best-known and most proud of his work as a DJ, sports announcer and on-air personality who met a host of celebrities via Michigan radio and TV stations in Kalamazoo (WKZO, WKLZ, WKMI), Grand Rapids (WZZM) and Battle Creek (WBCK). Enamored with the broadcasting business, Randy ensured that his sons both had star-worthy first and middle names that could stand on their own if the boys followed in his locally famous footsteps. He also served as Regional Vice President of Creative Circle, managed a tuxedo shop and worked as a car salesman at Denooyer Chevrolet in Kalamazoo, Mich. This 1949 graduate of Monroe Township School on Monroe Central Road in northern Preble County, Ohio, was yearbook editor, a cheerleader, a thespian and an Eagle Scout. As a teenager, Randy landed a summer job as a metal-pourer at Perfect Circle in Richmond, Ind., that led to a full scholarship at Wabash College in Crawfordsville, Ind. After two years, he joined the U.S. Coast Guard and worked as a radioman/telecommunications specialist in Alameda, Calif., until 1956. He was also part of the Coast Guard’s Drum and Bugle Corps. He completed his bachelor’s degree at Miami University of Oxford, Ohio, in 1958. Randy leaves behind his wife, Pat Lowman Easterling, with whom he would have celebrated his 64th anniversary on April 24. Other survivors are sons, Rudie Denis Easterling (Brenda Hart) of Huber Heights, Ohio, and Gary Wade (Amy) Easterling of Sarasota, Fla.; granddaughters, Amanda Easterling (fiancé Dan Cotton) of Kettering, Ohio, Stacy Easterling of Middleburg Heights, Ohio, Andi Easterling (fiancé Robert Hill) of Gulfport, Fla., and Rachel Easterling of Orlando, Fla.; brother, Larry (Karen) Easterling of Cortez, Colo.; sister-in-law, Barb Stonecash of Eaton, Ohio; nephew, Kent (Wendy) Stonecash of Eldorado, Ohio; and great-nephews, Austin Stonecash (fiancée Rachel Clark) of Fort Thomas, Ky., and Connor Stonecash of Oxford, Ohio. Randy was preceded in death by his parents; his brother-in-law, Calvin Stonecash; his nephew, Mark Stonecash; and his best friend and fellow Jungle Jim’s fan, Jack Cobb. He also leaves behind his world-class collection of vintage vinyl records amassed since his high school days. Randy’s wife said they never spent a penny on babysitters for their two sons. The young caregivers were thrilled with the alternative payment: a record or two. Not far behind in number is his extensive stash of t-shirts. Randy bought a short-sleeved souvenir nearly every place he visited and rarely had to wear one twice. Randy kept his keen sense of humor until the very end, delighting the nurses and doctors with his dry wit. His title as King of the One-Liners was well-deserved! Randy’s clear, melodic and distinctive voice was made for the air waves, and many a caller would dial the Easterling number just to hear his mesmerizing answering-machine message. He loved annual trips to sunny Florida and neon-flooded Las Vegas. Known for his champagne taste, Randy liked the best of everything. But he wasn’t ostentatious. His favorite treat was a Sausage-Egg McMuffin. He was a bright man with an impressive vocabulary who was full of fascinating facts and life stories. Pat praised him as a handsome, loving family man with beautiful hands and a kind heart. He will be greatly missed and remembered forever with love, affection and admiration. Visitation will be 5-8 p.m. Thursday, April 18, at Girton Schmidt & Boucher Gard Funeral Home in Eaton, Ohio. Service will be at 11 a.m. Friday, April 19, at the funeral home. Burial will be in Mound Hill Union Cemetery across from Fort St. Clair in Eaton. Memorials may be made to the Southern Ohio/Kentucky District Church of the Brethren, Brethren Disasters Ministries, P.O. Box 785, Greenville, OH 45331, or National Active and Retired Federal Employees (NARFE), 606 N. Washington St., Alexandria, VA 22314. Online condolences and other remembrances may be sent to the family by visiting www.gsbfuneralhome.com. To send flowers or a remembrance gift to the family of Randall M. Easterling, please visit our Tribute Store. "Email Address" would like to share the life celebration of Randall M. Easterling. Click on the "link" to go to share a favorite memory or leave a condolence message for the family.